Well, I’ll say a bit more than that ^^; This is Hiiragi Kagami as released by the Mama Chapp Toy company in Fall 2008. When I first read about the Lucky Star dolls, I was very interested but did not follow up due to the difficulty in obtaining them. 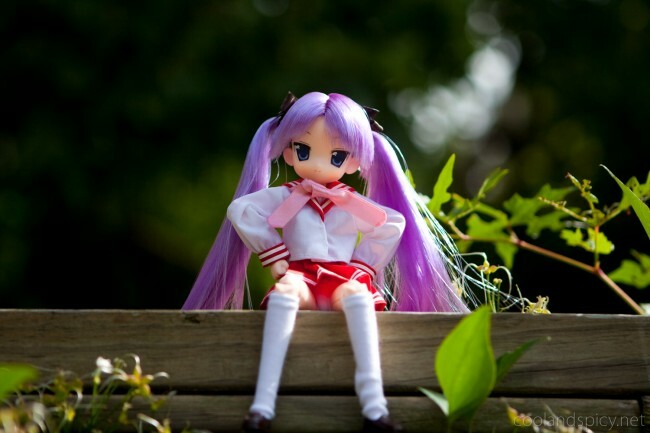 Kagami was an limited, exclusive release by MamaChapp and was only available for order through their site. 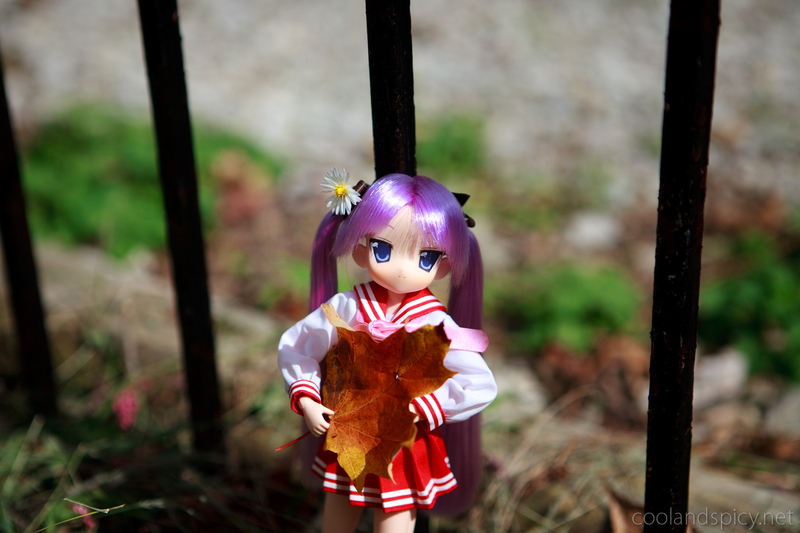 So, I abandoned the idea of owning this lovely Kagami for nearly a year. I have to admit that I’m still a doll n00b and don’t know much about Japanese dolls quite yet. While it seems Dollfies are becoming more popular, the smaller scale dolls like this Kagami seem a bit more varied. Lots of different sizes and body types. 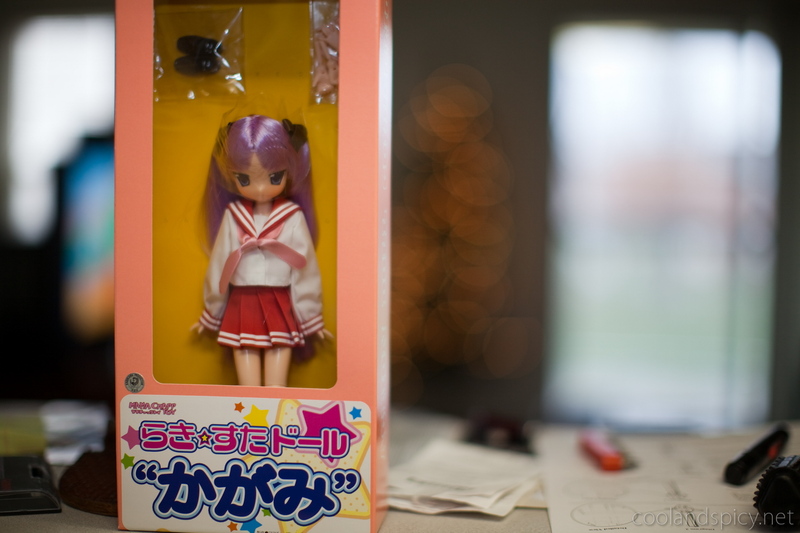 Kagami here is a 23cm doll and comes with her red winter school uniform. "D-Don't follow me around all day!" 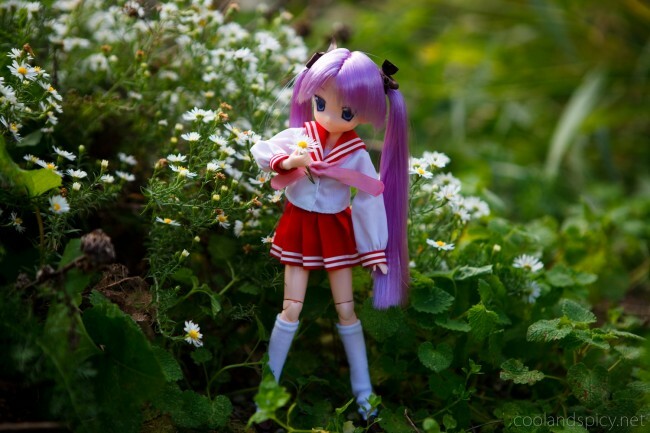 Kagami pics a flower from the garden. Kagami is made from ABS and PVC materials for the majority of the doll’s body, including the torso and limbs. The limbs are all jointed as are the torso, shoulders, and feet. This gives the doll a nice degree of poseability. The doll’s head and hands are composed of a softer rubber material. "Wh-What are you looking at? Baka!" Not quite a Dollfie, but there aren’t any Kagami Dollfies! I’m also not skilled enough to make my own Kagami Dollfie >_< Not that I think a Dollfie would necessarily be better than this Kagami anyway ^^. "Hey, look what I found! ^^"
Anyway, I hope you enjoyed viewing the pictures as much as I did taking them ^^. I have more to come in future posts too so be sure to check back soon! >w< i love it~ These pictures are amazing, especially the flower one! DD are tempting but yeah, quite expensive. Maybe some day though! .-= chun´s last blog ..Adventures of Mokotan~ 5 =-. .-= Actar´s last blog ..Finally. My Dreams and Hopes are Answered. =-. .-= Optic´s last blog ..Music Monday ~ KOTOKO – SCREW =-. Those are nice photos and the MamaChapp Kagami looks pretty nice. .-= Smithy´s last blog ..Dawn winter landscape =-. .-= Lylibellule´s last blog ..Devil on G-String =-. Nice photos. Dolfies really do open up more possibilities for new photo concepts. If I am not completley wrong Mama Chapps using Obitsu dolls as the base body for their dolls. I want one of those. I saw a Konata one on Ebay but it was WAY too expensive. 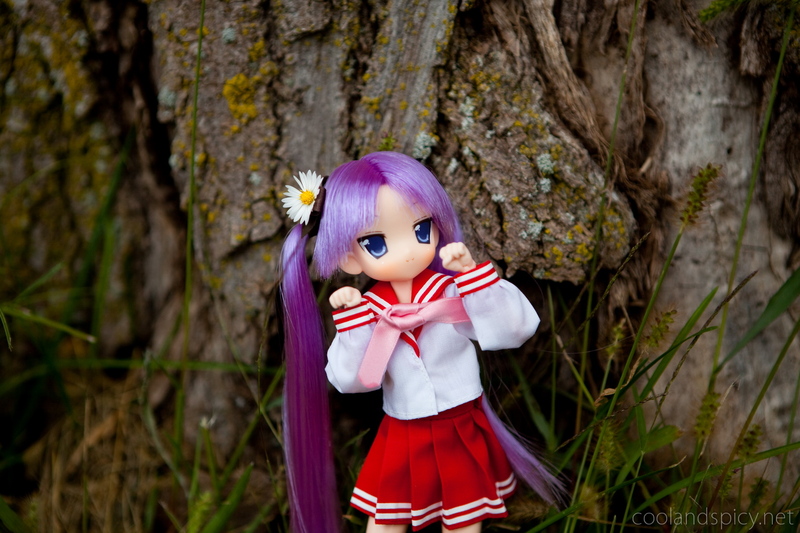 I heard that if you have a doll, they sell Lucky Star outfits and wigs on Dollfie. Whatever is cheaper works with me. But this doll is well made. Where did you buy it? Really? 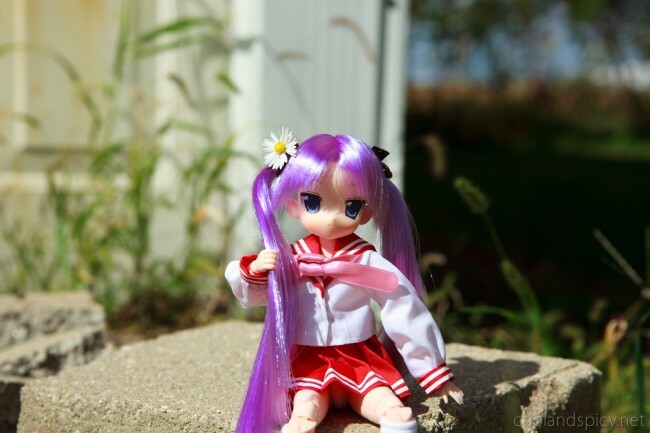 Lucky Star clothes and wigs for Dollfies? I should do some research on this ^^. This particular doll was purchased on Yahoo! Japan Auctions. I had to use a deputy service to place the big since most sellers there do not ship overseas. I have seen these dolls on Ebay but as you said, they are usually overpriced. Even with deputy fees, you can probably find it cheaper on YJA. is kagami the same height as a Azone doll? i can’t find any clothes for an Azone 23cm doll! were do you get Kagami’s clothes? I used Azone’s 1/6 scale clothes. They fit pretty well.